A few days ago I kept seeing candles around the forest, I couldn't pick them up so I looked up how to do so and it turns out you need to be standing in a certain position or something, so when I went back to try it out all the candles had gone. I thought maybe they'd been removed but I keep seeing deer with candle antlers around and i'm thinking maybe I just can't see them? Has this happened to anyone else? I don't have them either and I want them SO BAD. Sounds like those candles are the ones that randomly appear during login sometimes. Not sure what causes it but you can't pick them up and keep them. Other deer have candles from picking them up on previous occassions/having them cast on them by generous deer. 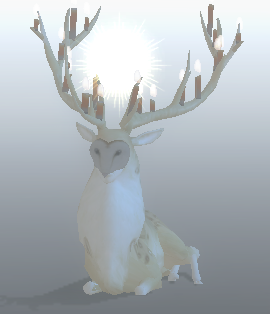 Hi, I've been on Endless Forest for over a year on and off, but have yet to try on a single candle.. !! Could someone be so nice to cast me one? Or provide any tips on how I can find one on my own..? I'll be laying near the twin gods in blue felt.. Thanks much & Happy Halloween!! Oh WOW - much thanks to the plain clothed angel I now have candles!! !